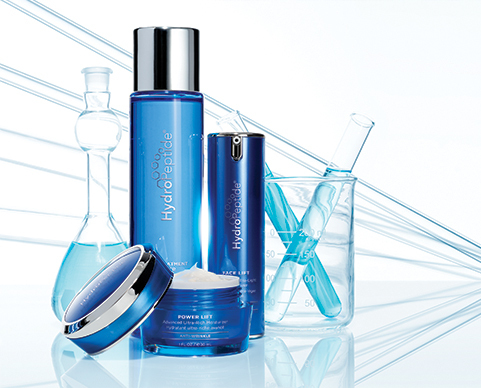 HydroPeptide® is an industry leader and award-winning anti-aging skin care collection that specializes in the latest breakthroughs in peptides, stem cells and growth factors. Peptides, along with antioxidants, have become a big buzzword for anti-aging and for good reason. Our peptides have been put to the test. They’re proven to work and aren’t irritating. This is why you’ve probably noticed that companies incorporate a few peptides in one or two of their products. At HydroPeptide, our focus is on peptides. We're leading the way in peptide technology and currently incorporate 21 of the latest generation peptides in the HydroPeptide Collection. This number is always growing as we innovate new peptides. Our promise to you is that we’ve created the most advanced and comprehensive peptide collection available and we’ll continue to lead the way in innovation and peptide technology. HydroPeptide is also paraben free, phthalate free, and cruelty free. The HydroPeptide philosophy is to address each of the vitally important elements in as few steps as possible, simplifying the path for healthy skin by reducing the number of products needed daily and dramatically accelerating anti-wrinkle results. Founded on the latest scientific technology, clinical research, and professional experience, our SIMPLY AGELESS SKIN KEY is your map to beautiful skin. Image Skincare is a clinical skin care company, providing natural skin care products and effective skin care solutions. Image Skincare’s highly effective anti aging skin care products utilize AHA blends, nutripeptides, retinols, lightening agents and anti-oxidants to prevent and reverse the signs of aging. Skin that looks aged, photo-damaged, pigmented, dull or tired will be rejuvenated with the use of our anti aging skin care products. in a serum and a creme form, it delivers unsurpassed preventive measures against the effects of aging, with a unique blend of plant derived stem cell technology and nutripeptides to help plump your skin. The MAX employs IMAGE’s three-phase CPN System of Correction, Prevention and Nutrition. Specially formulated pure, active ingredients provide protection at the cellular level against nutritional imbalance, oxidative stress and UV damage. It even repairs DNA. The Ormedic Product line combines the latest techniques in medical skincare with fresh, natural ingredients to create balanced, healthy skin. These organic skin care products repair and rebalance skin for a stunning, moisturized look and feel. Moreover, Ormedic products are effective for all skin types. Ormedic organic skincare products contain soothing botanicals that create the perfect accompaniment to unbalanced, sensitive and post-treatment skin. Clear Cell provides skin care for acne prone skin and truly oily skin types. Prevention + uses a form of zinc rarely used in products because it’s expensive, but the particles are so small that it prevents the white, cakey residue left by some sunscreens. Prevention + completely absorbs into the skin leaving it silky and smooth, and completely protected.